Thanks to the contractor whose done so much great work on the house, after almost five years the old skeletal greenhouse out back is finally covered. A custom tarp I ordered had been sitting around for ages, waiting for someone who wanted to take on the task. Rick, the contractor, took pity on me and added the rather mundane job of installing the cover to his busy summer schedule this week. Sure, the mice have chewed a couple of small holes in it. But after standing inside the newly enclosed space for a few minutes, I began to think of them as some much-needed ventilation. The greenhouse, though potentially functional, was the last real eyesore for me on the farm. Sitting there, raw and naked in the sun, weeds and chipmunk burrows sprouting up through the gravel base. It chewed away at me, offending my semi-perfectionistic tastes. I tried not to let it bother me. Really, I did. But every time I had to weed whack its inhabitants, I cursed it’s unfinished state all over again. Then suddenly, miraculously, after only two days I didn’t have to feel that way about it anymore. It was done, finished, an eyesore no longer. It’s funny how something can change so simply, so quickly, go from problem to possibility in a very short amount of time. It can go both ways I know, from good to disaster. But here, now, I’m just thankful for a long overdue job to be done, one that was way outside my own ability. Now when I go out to the greenhouse I see room to grow, and in more ways than one. I can envision rows of plants there, or a tractor making itself at home. I bet I could even park my car in there in a pinch, if needed. I see the nettles and dandelions and chipmunks moving out, and human occupation taking over once again. Okay, maybe the chipmunks will never totally move out. But now that the greenhouse space has become useful for me, I might even feel generous enough to share. 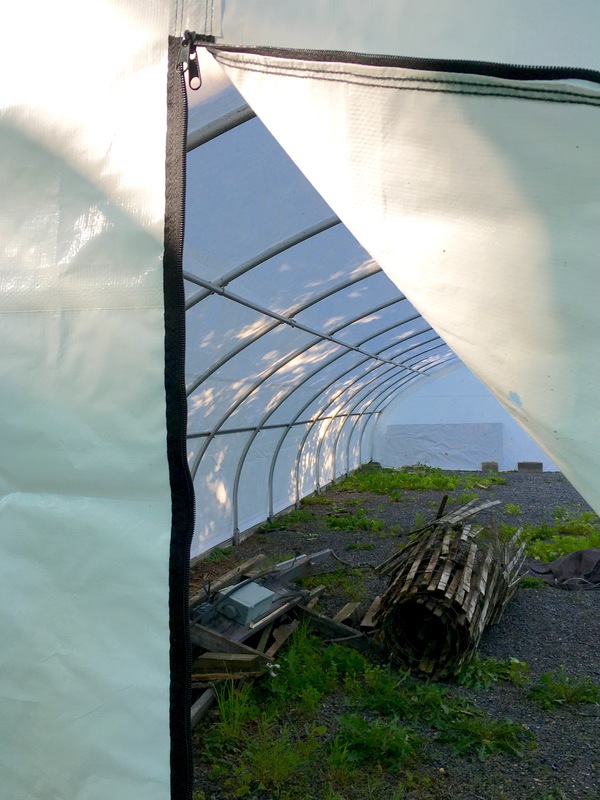 I am so happy your greenhouse is coming along…so many possibilities!